Mars Exploration Rover 'Spirit' has been hit by two mysterious computer re-boots over the weekend, leaving Nasa scientists stumped. 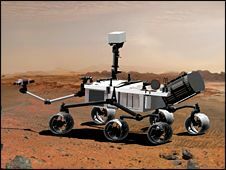 Although the US space agency insisted on its official website that the rover was operating within its acceptable parameters, the fact that the computer rebooted without obvious reason is causing concern. "While we don't have an explanation yet, we do know that Spirit's batteries are charged, the solar arrays are producing energy and temperatures are well within allowable ranges," said Nasa's John Callas. "We have time to respond carefully and investigate this thoroughly." Spirit landed on Mars back in 2004, and has travelled just under five miles – but has exceeded expectations and its own predicted lifespan. "We are aware of the reality that we have an aging rover, and there may be age-related effects here," Callas added.